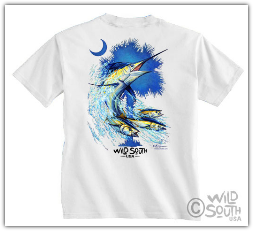 Charleston Graphics, LLC is a fully equipped Screen Printing, Graphic Design and Promotional Product company. What sets us apart at Charleston Graphics is having an artist as the owner of the company. With over 25 years experience, we have the knowledge and creativity to help you separate your business from the competition. We can help you build a recognizable brand from the look of your logo, to your label, to branded items, and exciting looks for your ad campaign, using full color illustration. Please visit CharlestonApparel.com to view our retail line. Customized Promotional Products like koozies, stickers, glass and ceramic drinkware, just to name a few. Our focus is getting your company or event noticed, whether you already have a logo you like, or you work with us to create a new logo for you. Let us help you put your image to work for you. 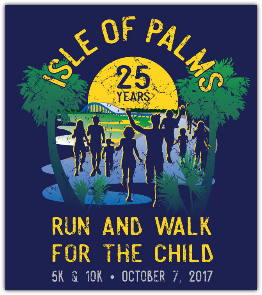 Kevin Curran won the poster contest for the 2017 Isle of Palms Run and Walk For the Child. The event is a Non-profit 5K and 10K race for the healing and prevention of child abuse in Charleston. 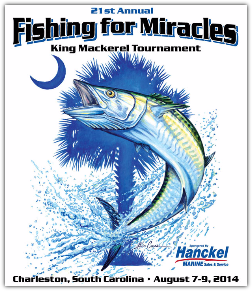 Kevin Curran was honored to do the poster design for Fishing For Miracles King Mackerel Fishing Tournament, which benefits MUSC Children's Hospital. We specialize in custom screen printed and embroidered apparel, as well as promotional products for businesses, organizations, events and retailers. We have access to an extensive variety of T-Shirt and Apparel brands. Please click on the "Custom Apparel" button at the top of the page to view some of what we offer. We will work with you to find the best fit for your marketing or retail needs. 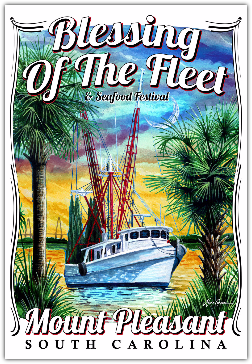 Kevin won the poster contest for the 2014 Mount Pleasant, Blessing of the Fleet. 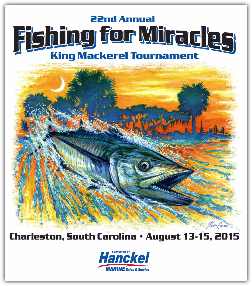 Charleston Graphics LLC screen printed the t-shirts for the event as well.